The Fairview neighborhood has historically been one of Camden’s most vibrant neighborhoods. Built by the federal government in 1919 as housing for shipbuilders, the neighborhood surrounds Yorkship Square, a traditional high-density mixed-use center. As jobs disappeared over the past 20 years, however, the neighborhood deteriorated, marked by abandoned buildings and dilapidated homes. In 2001, Camden city officials, community leaders, clergy and other stakeholders joined forces with the Department of Community Affairs and the New Jersey Housing and Mortgage Finance Agency to formulate a redevelopment plan to reverse this decline. The redevelopment effort includes the rehabilitation and new construction of high-quality, single-family workforce housing; affordable rental units to prevent current residents from being pushed out; a community center; retail spaces; and improvements to infrastructure. The first three phases of this four-phase neighborhood redevelopment effort have been completed, with 225 of a planned total of 276 residential units constructed. The first phase involved the restoration of four vacant buildings and construction of two new buildings creating 72 units of rental housing. It also included the renovation of 35 vacant single-family homes. Phase II restored 35 units of vacant and foreclosed single-family homes and 40 more rental units with eight apartments set aside for homeless families. Phase III restored 43 more single-family homes. Another 15 single-family homes are planned as part of Phase IV, along with 36 apartments for seniors. All new construction and rehabilitated properties were built or converted to Energy Star standards, including high-efficiency heating and cooling, energy-efficient appliances and upgraded thermal envelope. Complementing the increased number of new housing options, a new 3,000-square-foot community center was built to serve as a focal point for community meetings, as well as providing a full array of social programs including nutrition and exercise classes for seniors and art and literacy programs for youths. Infrastructure investment has also enhanced the neighborhood. New pavers, street trees, historic lighting with fixtures for banners, waste receptacles and benches are now featured around Yorkship Square, and the main entrances to the square are lighted with new historic fixtures and signage. This project was completed by a partnership between Cooper’s Ferry Development Association and Fairview Main Street. Due, in large part, to the increased neighborhood activity spurred by residential redevelopment and the new community center, commercial retail space in Yorkship Square, the historic town center, was brought back to life. Both the square and nearby Collings Road boast several small retail establishments including convenience stores, restaurants, a grocery store and laundry facilities. The neighborhood is also home to an elementary school, a charter school for grades 5-8 and several recreation fields for baseball and basketball. 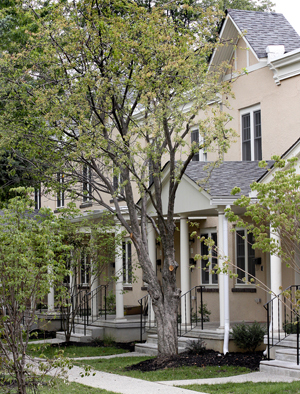 Fairview’s central location also ties the neighborhood into the larger surrounding community. Several bus lines are within a 20-minute walk, and there are bus stops directly in front of three apartment buildings. As significant as the Fairview Village project is in its own right, it also represents an approach to redevelopment that is being replicated in other areas of Camden. In the Cooper Plaza neighborhood, historic homes and commercial spaces were renovated while the surrounding lighting, sidewalks and streets that framed it were restored. 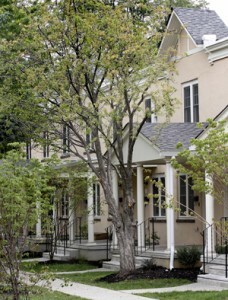 As the development of more quality affordable housing becomes necessary, and the age and economic stress of historic inner-city neighborhoods becomes more evident, innovative and resourceful examples of smart growth coupled with preservation, such as Fairview Village, deserve recognition statewide as models of excellence and conscientious planning.